When it comes to buying a home, there’s a lot more to the process than just finding an affordable home for sale and having enough money for a down payment. Most people need loans to finance such a large purchase, but even as the housing market has rebounded from the foreclosure crisis and low property values of 2010, mortgages remain very difficult to acquire. A report from the Urban Institute, a Washington-based economic-policy research group, concludes that 1.25 million more mortgages could have been made in 2013 on the basis of conservative lending standards practiced in 2001, years before the housing bubble began to inflate. Whether or not a lender approves a borrower for a mortgage depends on several factors, like income and outstanding debt, but looking at the credit scores of mortgage borrowers during the last several years shows just how tight the market has been post-recession. Here’s how it breaks down. The Urban Institute estimates that the stringent credit score standards for mortgage origination resulted in 4 million mortgages that could have been made (but weren’t) between 2009 and 2013. From 2001 to 2013, consumers with a FICO credit score higher than 720 made up an increasingly large portion of borrowers, from 44% of loans in 2001 to 62% in 2013. 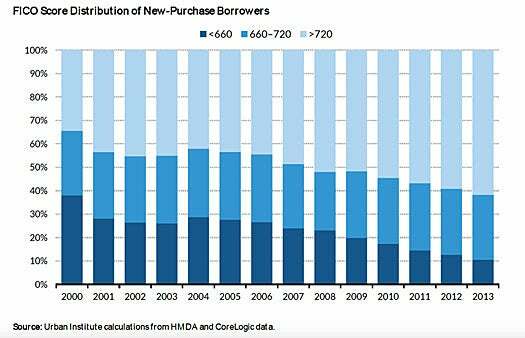 Consumers with scores lower than 660 made up 11% of borrowers in 2013, but they represented 28% of home loans in 2001. “Even so, it is inconceivable that a decline in demand could explain a 76% drop in borrowers with FICO scores below 660, but only a 9% drop in borrowers with scores above 720,” the report says. Millions of Americans are still feeling the impact of the economic downturn on their credit scores, because negative information like foreclosure, bankruptcy and collection accounts remain on credit reports for several years. Rebuilding the credit and assets necessary to buy a home takes time, particularly in such a tight lending climate, but by regularly checking your credit — which you can do for free on Credit.com — and focusing on things like keeping debt levels low and making loan payments on time, you can start making your way toward a better credit standing. What’s the Easiest Way to Improve Your Credit? This article by Christine DiGangi was distributed by the Personal Finance Syndication Network.